I grew up in a religious family but I am not particularly religious. I believe that there is (are) some Supreme Being(s) above us, but I consider the religious narrative and beliefs of organized religion to be fiction; albeit fiction with many useful lessons, but nevertheless, fiction. One of my favorite religious stories is of a pious man who was once caught in rising floodwaters. He climbed onto the roof of his house and prayed to the heavens to save him. Soon, a neighbor came by in a canoe and said, “Hop in and we’ll paddle to safety.“ The pious man replied, “No thanks, I’ve prayed to God and I’m sure he will save me.” Later the police came by in a boat to rescue him and again he turned it down because he was sure God would save him. A little later a rescue helicopter hovered overhead, let down a rope ladder and said “The waters will soon be above your house. Climb the ladder and we’ll fly you to safety.” And again, the pious man refused help. Soon, the floodwaters were too much to bear and the pious man drowned. I thought about this story when I was at the International Consortium of Agricultural Biotechnology Research conference in Kenya. Despite security concerns, about 200 people braved to attend this conference at a resort in Kenya, where about half of were African scholars. The main lesson of the conference was how many new opportunities were introduced but unused because of heavy regulation. In a previous paper, I discussed the thousands of lives and hundreds of thousands of cases of blindness that might have been saved if the regulatory burden on Golden Rice was loosened and the commercialization was allowed 10 years ago. But in Kenya I learned about many other cases. 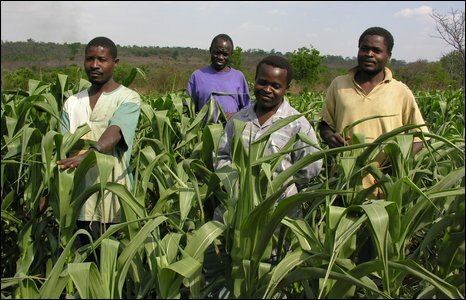 For example, scientists developed a corn variety that has combines drought-tolerant and insect-resistant varieties for use in smallholder farms in sub-Saharan Africa. However, the use of the technology is blocked by restrictive regulations because the patent of the technology is supposedly owned by large corporations although they are allowing its use for free. People complain about Monsanto raking in millions from poor farmers in Africa, but in this case, the technology is given away. I do not see Apple or Samsung doing the same, but many people still benefit from their phones. We know that insect-resistant maize in South Africa, increases yields for smallholders by ~30%, and if there is a chance to avoid droughts, that is for the better. Another innovation developed by African plant scientist Jennifer Thomson is new genetically modified (GM) trait that can address the maize streak virus that is endemic to Africa, which causes significant crop losses, ~30% and above. Again, the commercialization of this variety is prevented by regulatory constraints. A third example is the transgenic variety that is able to address a major disease in regular bananas and plantain-bananas, which are a major staple food for many subsistence farmers in East and Central Africa. Again, these varieties were developed by African scientists and some of these transgenic varieties can also address nematode problems that reduce yields by 20-30%. These varieties are currently banned and as a result, they put many lives at risk. As an economist I can figure out how many lives can be saved statistically, and the numbers are staggering. About tens of millions of people depend on the bananas, corn is a main staple food for much of Africa, and even if a few percent points don’t suffer from malnourishment, the gains are immense. These are but a few examples of how we are missing out on opportunities to address rising challenges in agriculture and food security and the price is paid by the poor. But this cost is likely to be much more severe in the future. We are all concerned about climate change, and addressing climate change will require tools for mitigation and adaptation. Already, GM varieties help mitigation, because in many cases they allow no-tillage varieties that sequester carbon. But when it comes to adaptation, we need quick ways to modify varieties to adjust to changes in weather. Transgenic technologies are great tools that are given ‘by the gods’ to develop new varieties. Who will suffer from not using them? I understand that some oppose GM developments because of unknown safety risks, while others oppose it because of its association with monoculture, industry and big corporations. But the net effect may be that we will all drown because we missed the canoe, the boat and the helicopter. “God helps those who help themselves,” facetiously, to illustrate a kind of assured-of-their-own-rightful-place-in-God’s-graces mentality, among the haute bourgeoisie of his day. It still applies today, non?